Now that I temporarily unemployed, I have fallen in love with knitting again. To me, knitting is a little bit like magic. When you look closely, it seems crazy - waving around a couple of sticks and tangling them up with some string and all of the sudden fabric appears. It feels a little bit like conjuring garments out of thin air (although in reality it is somewhat more labor-intensive and expensive than that). I never cease to be fascinated to see that I can actually create decent looking projects this way! 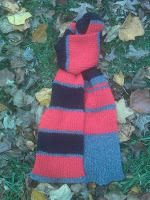 I recently finished my scarf in Bo Manor colors, which I began when Kieron made the varsity football team (he is now a junior in college). At least I have one more football season to wear it at Kellan's games. I currently have several projects on needles - socks for my mom, a baby blanket, and a knitted quilt. The socks should be done Thanksgiving week, the quilt by Christmas, and the blankie when I get to it. I was in my LYS yesterday with Jen, Rich and Bryna, and we were talking BBBBs (Big Bad Baby Blankets). Jen just finished one for a child who is now 2 and is starting another for someone who isn't even pregnant yet. The owner of the store told us that a lot of people our age just always have baby projects going, to be prepared for the next pregnant friend or relative. There's something so satisfying about making things, and I absolutely love making gifts for people. And what's better than knitting for babies. Now that I'm becoming a fairly proficient knitter, I'm thinking about branching out to more difficult projects. Most of the sweaters I own are at least three years old so they are starting to wear out, and I'm thinking about trying to make one when I get past the Christmas knitting rush. I would need to start simple so I'm thinking about trying a beginners pattern with some chunky superwash merino wool. 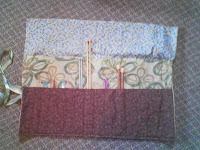 In addition to knitting I made a needle case for Megan G's birthday, and it got me thinking about taking up sewing again. I have often thought about making some of my own clothes, that is a sort of scary endeavor. Where will I find time for this crafting lifestyle? That I haven't figured out yet, but at least knitting travels well and can be picked up whenever you have a spare minute. I can hardly believe it... it hasn't really sunk in yet. We are going to have a president who is bi-racial. Who is African-American. Who is young(ish) and idealistic and hopeful. Who claims that we are not red states and blue states but the United States. Two years ago I was hoping for this, but afraid that it wouldn't happen. My thoughts are all jumbled right now, but I want to jot down a few reflections. I was more excited today than when I first voted in an election. Tonight, I watched the coverage hopefully and at 11 pm John Stewart (I was flipping between the Indecision '08 and BBC coverage) called the election and announced that Barack Obama was the next President of the United States. Seconds later the phone rang and it was my sister calling from Indonesia to celebrate and see if our mom was crying. A little later my aunt called to celebrate too. As we watched the victory speech, I was struck by the enormity of this event. Grant Park in Chicago was an unbelievable sea of people, all so excited and moved. Jesse Jackson was in tears. Oprah was crammed into the crowd crying. When have you ever seen Oprah crammed into a crowd like a normal person? This is a movement where Oprah is just part of the crowd and the people are the heart of what is happening. I was in tears. We have taken a huge step toward racial justice. He has already inspired me to resist some of the cynicism that is the norm in American politics and erodes hope away. Our next president has the potential to face the world in a way that will win back the trust and respect of the world. On November 4th, Marylanders will vote on Question 2, a referendum to amend the stated constitution to allow slot machine gambling. If it is passed, 15,000 slot machines are slated for venues in Anne Arundel County, Cecil County, Worcester County, Rocky Gap State Park in Allegheny County, and Baltimore City. "Gambling, as a means of acquiring material gain by chance and at the neighbor's expense, is a menace to personal character and social morality... Organized and commercial gambling is a threat to business, breeds crime and poverty, and is destructive to the interests of good government... It serves as a 'regressive tax' on those with lower income. In summary, gambling is bad economics gambling is bad public policy; and gambling does not improve the quality of life." (2004 Book of Resolutions, "Gambling" #203). At this year's Annual Conference in June, the Peninsula-Delaware Conference approved a resolution opposing this referendum. I also found an interesting editorial arguing against slots, and also an article that talks about estimates that both sides are making about potential revenue from slots. I know that this is a very complex issue, but I am convinced that slots are not a good solution to our economic problems in this state. Slots tend to increase crime, poverty and addiction in the surrounding community; this could likely end up costing tax payers enough to make the whole thing not worth it. Plus, the effects of problem gambling would be devastating to some families. Even if people want to make the argument that the financial and emotional consequences are the fault of the problem gamblers, should children and spouses have to shoulder the burden? This is not a quick fix -- all of the financial estimates are just that, estimates. If this amendment passes, we will still have to wait for zoning fights (for all people say slots are good for communities, it seems no one really wants them in their backyard), construction, and start-up before the money starts coming in for schools and such. I don't claim to have all the answers, but I do think there has to be a better way to fund our schools.